According to comScore, 82% of prospects can be reached via social networks. In addition, Aberdeen Group has found that more than 72% of salespeople using social selling as part of their sales process outperformed their sales peers and exceeded quota 23% more often. Why should salespeople be involved? 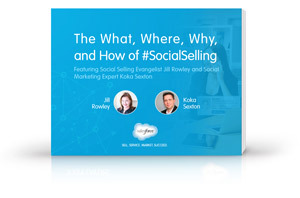 How can you become an effective social seller? Download this free e-book to learn and implement all of the above—and, ultimately, drive more sales.